Emily C. Rose’s Portraits of Our Past is a meticulously painted canvas of life in the 18th and 19th centuries for southwestern Germany’s rural Jews. A student of European history, Ms. Rose began her research in 1994 out of curiosity about her own family’s beginnings. She does an impressive and scholarly job of assembling original sources using remarkably preserved records from both German and Jewish archives of small towns and villages. She expands a narrowly focused family history into an interesting record of a resourceful and resilient people who make lives, create families and build communities in spite of constant discriminatory practices, malice and capriciousness of the churches and the ruling princes. 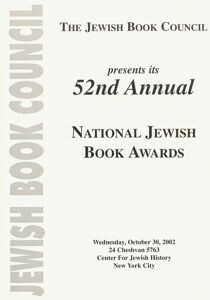 Emily attended the National Jewish Book Awards Presentation Ceremony held at the Center for Jewish History in New York City on October 30, 2002. 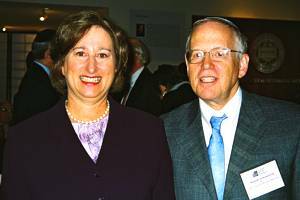 She was pleased to congratulate Professor Steven Lowenstein of the University of Judaism in Los Angeles whose book, Jewish Cultural Tapestry: International Jewish Folk Traditions (Oxford University Press), was the winner of the Jewish Book Award in the category of Sephardic/ Ashkenazic Culture.